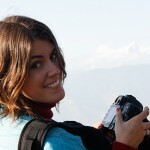 The universal paneer - Comidas Magazine - Because we love comidas. A staple of Indian cuisine, paneer is a goat cheese with its own characteristics: it’s not cured or melted, but it is cooked. Together with eggs, it’s the principle source of protein in this predominantly vegetarian country. 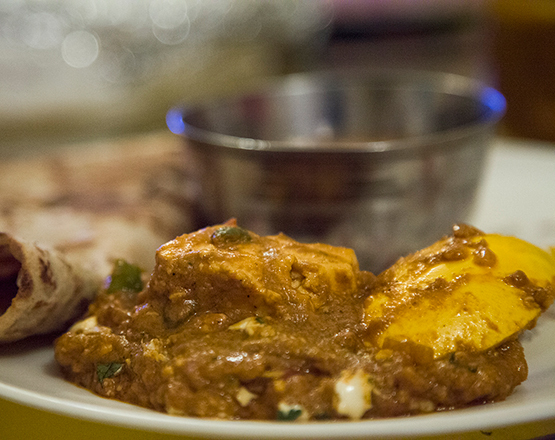 However, paneer is not only consumed in India, but also in Bangladesh, Pakistan and Nepal. At first glance you might think that it’s a fresh cheese, but it’s different in that fresh cheeses are salty, while paneer isn’t. Uncooked, it is completely insipid. So then, what is it that makes paneer such a delicacy? The fact that its flavor changes completely when it’s cooked, since it absorbs all the flavors of the ingredients that are added to it, thereby mitigating the intensity of these accompanying spices. 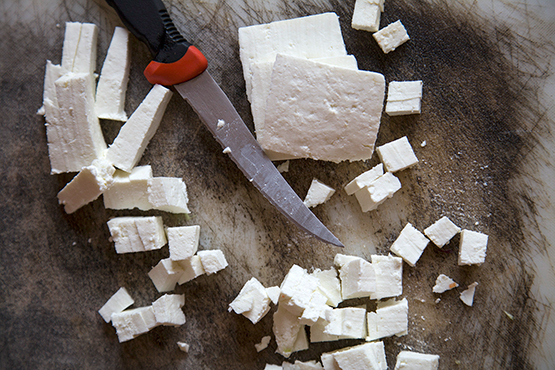 You can buy prepared paneer anywhere, although it’s also easy to make at home. You only need two ingredients: milk and lemon (although any acidic liquid like vinegar also works). The milk is first boiled and then the lemon juice is added – causing the milk to curdle. The liquid whey is then separated. This mixture is filtered (and if you want, you can save the liquid to use next time together with the lemon juice) through a specially designed cloth, which is then used to wrap the solid part while it cools for a couple of hours until turning into a block of cheese. And, that’s it! The paneer is ready to be cut into cubes! This is the shape that this cheese usually takes. It’s sometimes skewered with peppers and onions and grilled. 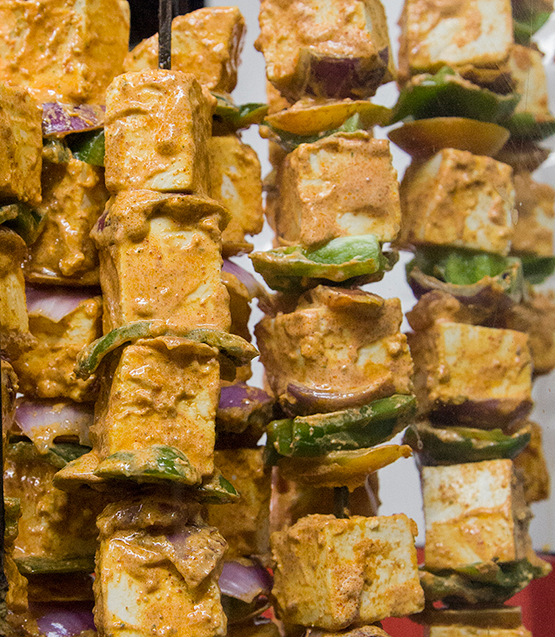 This is known as paneer tikka, the vegetarian version of the famous chicken tikka, which is marinated with its corresponding masala (a spice mix). There are infinite ways to eat this white cheese: palak paneer (with spinach), chili paneer (the spiciest version), matar paneer (with peas and onion, tomato sauce), paneer parantha (parantha bread stuffed with paneer) and kadhai paneer (in tomato sauce with pieces of green pepper and onion), tend to be the most popular options in local establishments, but as with all cuisine, paneer is prepared with different combinations of ingredients in homes throughout the country. Even big multinational restaurant chains include it on their menus, which is why it’s easy to find paneer as a pizza topping or stuck between two hamburger buns. Simply put, paneer tastes good on everything!